WASHINGTON -- The Republican-controlled House voted Tuesday to condemn President Barack Obama for failing to give 30-day notice to Congress about the exchange in May of American prisoner Bowe Bergdahl for five Taliban leaders held at the U.S. prison at Guantanamo Bay, Cuba. The vote was 249-163, with close to two dozen Democrats breaking ranks and backing the nonbinding resolution. "By setting free five top Taliban commanders from U.S. custody, the Obama administration made Americans less safe," Speaker John Boehner, R-Ohio, said in a statement. The vote castigating Obama came at a crucial moment for the administration as it sought to rally international and congressional support for steps to combat the rising threat of Islamic state militants in Iraq and Syria. The debate and vote coincided with a White House meeting in which the president discussed his strategy with House and Senate leaders. It also came on the eve of Obama's address to the nation. "What poor timing for a resolution," said Rep. Sheila Jackson Lee, D-Texas. Republicans insisted that Obama clearly violated a law requiring the administration to notify Congress at least 30 days before transferring prisoners from the Guantanamo Bay prison. A Government Accountability Office report last month also reached that conclusion. "The administration deprived Congress of the opportunity to consider the national security risk or the repercussions of negotiating with terrorists," said Rep. Howard "Buck" McKeon, R-Calif., chairman of the House Armed Services Committee. Five senior Taliban were released from the U.S. prison at Guantanamo in exchange for the Army sergeant who had disappeared from his post in Paktika province in eastern Afghanistan on June 30, 2009. The five Taliban are to remain in Qatar for a year. Republican lawmakers and some Democrats were angry with Obama and members of the administration for failing to notify them about the swap even as 80 to 90 members of the government knew of the exchange. The administration has offered a number of explanations for keeping Congress in the dark, including concern about Bergdahl's health and safety required speedy action and concern that lawmakers would divulge details of the deal and scuttle it. Rep. Adam Smith of Washington state, the top Democrat on Armed Services, said the president should have notified Congress, but Obama has said his constitutional authority as commander in chief superseded the law to apprise lawmakers. The resolution was a partisan attack by a Republican House on a Democratic president, said Smith, who argued that Republican President George W. Bush repeatedly violated the law with post-Sept. 11 warrantless wiretaps and indefinite detentions. Democratic Rep. John Barrow of Georgia, who faces a tough re-election this fall, backed the resolution, complaining that Obama negotiated with terrorists and treated Congress as an afterthought. Some in Congress have said Bergdahl was a deserter and the United States gave up too much for his freedom. Several lawmakers have cited intelligence suggesting the high-level Taliban officials could return to the Afghanistan battlefield. The resolution, which lacks the force of law and won't be considered in the Senate, "condemns and disapproves of the failure of the Obama administration to comply with the lawful 30-day statutory reporting requirement in executing the transfer of five senior members of the Taliban from detention at United States Naval Station, Guantanamo Bay, Cuba." The measure says these actions "have burdened unnecessarily the trust and confidence in the commitment and ability of the Obama administration to constructively engage and work with Congress." 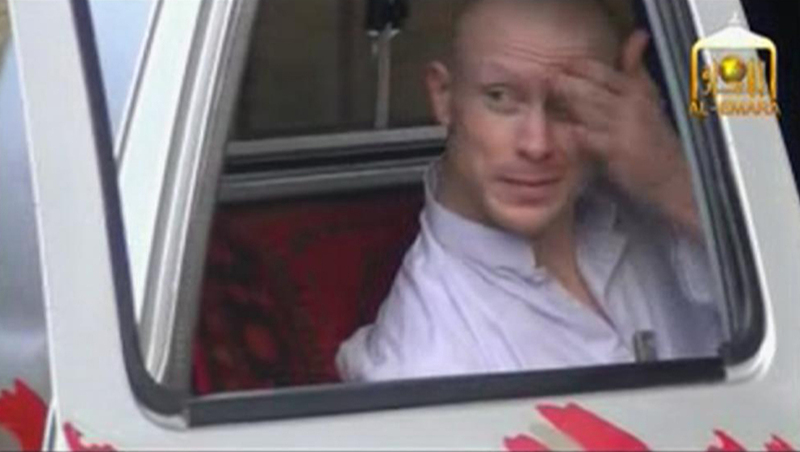 The resolution does express relief that Bergdahl has returned safely to the United States. The Joint Chiefs of Staff has unanimously supported the exchange, insisting that the United States has a sacred commitment to men and women who serve that it will never leave anyone behind on the battlefield. Army Gen. Martin Dempsey, the chairman of the Joint Chiefs, said the swap in May was "likely our last, best opportunity" to free Bergdahl. Bergdahl is performing administrative duties at Fort Sam Houston in San Antonio while an investigation into how he was captured by the Taliban is conducted.